William Joseph Dunlop, O.B.E., M.B.E., will long be remembered by bikers world wide and his many friends for his record breaking achievements on the famous Isle of Man TT Mountain circuit. However, many of those people may not be aware that family man Joey was a caring person who undertook a number of lone and dangerous missions to the former Eastern European Countries in a van loaded with gifts and provisions for young children who were being deprived of life's essentials. A group of ardent Joey fans decided to approach his wife Linda, to seek her agreement to raise funds to construct a facility that would be of benefit to the community and also be a fitting memorial in recognition of the varied achievements of the person affectingly known as 'Yer Maun'. It was during the initial discussions with Linda and Honda's Bob McMillan that it was revealed that Joey would have liked to have constructed a facility to benefit poeple, especially children, with a disability. Once this group of admirers had been given the green light by the Dunlop family, fund raising plans were instigated and the Joey Dunlop Foundation, (formerly known as the Joey Dunlop Injured Riders Fund) was established, initially to raise funds to install a lift in the TT grandstand to make access possible to the main viewing gallery for the disabled. The second undertaking was to provide much needed accommodation for the physically challenged and their families on the Isle of Man. Apart from a sizeable contribution from Arai Helmets, (£57,000) all funds have been raised by the Foundation committee members who have worked long hours, especially during the summer months, and have always looked for much needed extra support from Joey Dunlop fans throughout the world. In 2005 a property was purchased in Victoria Road, Douglas, near the TT Grandstand,at a cost of £200,000. 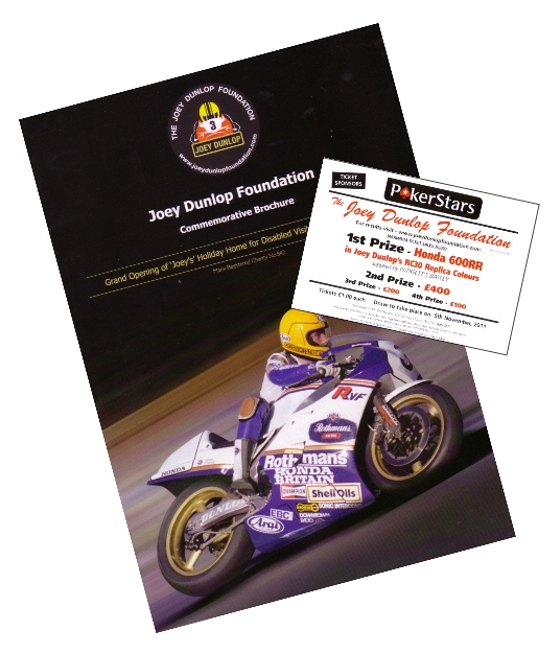 In 2007 the Joey Dunlop Foundation managed to raise £91,000! This is a fantastic achievement, especially as the Centenary TT did not bring in the revenue which we had hoped for. Unfortunately the building tenders came in at £200k over our available budget, throughout the winter and into the spring of 2008, we looked at ways in which we could provide disabled holiday accommodation on site at a cost within present finances. After a meeting with Linda Dunlop & John Harris, we decided to source 3 independent luxury pine lodges and with consultation with various groups we had to come up with a unique arrangement which would satisfy the planning department. The manufacturing companies that build these fully fitted lodges would not take on the contract for the proposed unique buildings thus leaving the JDF with a huge dilemma on what way forward the charity should take. In June 2009 the charity have purchased Braddan Bridge House and sold the Victoria Road site. The new site has many advantages over the previous site with the main points being that it is on the TT Course with excellent viewing of the TT Races and it has ample space both inside and out. The plans for the conversion, from single dwelling to 3 self-contained apartments, was passed in July 09. Works were soon underway and after many months hard work the House was finally formally opened on Mad Sunday during TT 2010. The first Guest was able to stay in comfort during the 2010 Manx Grand Prix. This was thanks to the Manx Lottery Trust who granted well over £44,000.00 of which paid for all the specialist equipment such as hoists, beds and furniture. Since then the Joey Dunlop Foundation have opened the 3rd apartment as well as the adjacent Reception and Laundry areas that are located in what was the garage. Summer 2011 is a busy period as BBH is fully booked with many, many people enjoying holiday breaks on the Isle of Man, all thanks to the Foundations accessible accommodation.